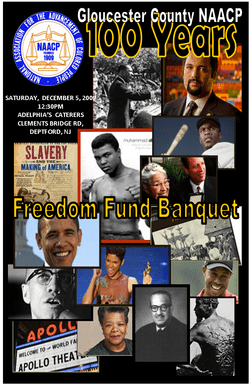 On behalf of the Gloucester County NAACP, it is, again, my pleasure to welcome you to our Annual Freedom Fund and Game Changers Dinner. I particularly want to recognize all our 2017 distinguished honorees and first time guests to this event. We, at the Gloucester County NAACP, are more than honored to have the privilege and the opportunity to honor you on October 21, 2017. Although each of tonight’s dedicated honorees work in different fields and specialize in a specific area, all are committed to a common goal: to utilize their unique talents and perspectives and work to enrich and strengthen our needs and wants in building a colorblind society with freedom, justice and opportunities for all. Their precise area of specialize service and contributions to community is not as important as the recognition and appreciation of “committed service” that these men and women, from diverse backgrounds, bring to all communities of South Jersey. This evening we celebrate each one of our honorees’ contributions in making our diverse communities throughout South Jersey a model, far beyond our borders, for understanding and respect for one another’s history and culture. In presenting these awards, we go beyond the pomp and circumstance, we salute each for their open and understanding mind, big hear, a concern for fellow human beings, willingness to support the mission of the NAACP and principals of freedom and equality enshrined in our United States Constitution. As we enter the final stretch of a very challenging year for persons of color in the United States and divisiveness between people in our nation, the Gloucester County NAACP will continues its constant, indispensable presence in doing the hard work in strengthening and expanding our relationship with responsible policy makers, businesses, clergy and all people committed to work against racial/ethnic and other forms of discrimination and for social justice. Soon the holidays will be upon us, and leave us all too fast. During the holidays, families reunite, we travel to visit; family and friends come to visit us. After New Year we go back to our regular routine again, bills must be paid; its cold and we tend to be more solitary once again. I hope this event provides you the opportunity to re-connect with friends, make new acquaintances, and share your experience in promoting and embracing the diversity our nation is evolving into. May you find much encouragement as you listen to speakers, interact with other guests and take time to get to know our 2017Game Changers Award recipients. Please join me in honoring tonight’s 2017Game Changers, whose example should inspire us to follow.